One of the things I hate, and I don’t know why, is when someone shows up to an interview holding a cup of coffee. It bothers me. A gentleman came with a danish along with his coffee. He was toast. I was going to give him the bum’s rush. We sat down and he said, “I apologize for the coffee and danish. I’m diabetic and have to eat something.” “No problem,” I said with a look of sincere appreciation for his plight. We had a good half hour chat and I submitted him to my client. First, give the person a firm handshake. I interview a lot of veterans. One day I thought I had the entire Marine Corps in my office. After a while I was actually scared to shake hands with them! I was in pain. So finally I said, “Firm hand shake good. Break interviewer’s hand, bad.” They all laughed. 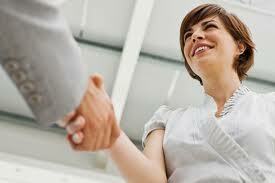 Second, make eye contact, smile, introduce yourself, and thank the person for meeting with you. And here’s how to start the conversation. It works for me, but it has to be genuine. Don’t lie or fake it. And only use it once. If you use this when you meet the HR director and then the CEO, and either one mentions it to the other, you will lose all credibility. Of course, if after you have done this, in the next interview you walk into a different person’s office and something blatant jumps out at you – their diploma shows that you graduated from the same college – then there is nothing wrong in saying, “Oh, you are a … too.” Then let the interviewer take the lead. The difference is that in this case there is no acting. Again, in neither case should there be any lying. And in both cases, you hand over to the interviewer the impetus for turning the initial comment into a conversation. Hi! Just thought I would tell you something… This is twice now I’ve landed on your blog in the last 3 weeks looking for completely unrelated things. Great Info! Keep up the good work.